A Newsletter That Will Help Save You Money! Welcome to the Bookkeeping EZine signup page. The newsletter that will help save you money! It is a good idea to stay up to date with the latest changes in tax law and to have someone to help provide you with important bookkeeping tips and tax saving strategies. 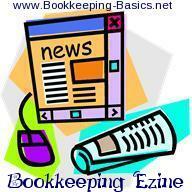 Bookkeeping EZine is a must!" This is exactly what the Bookkeeping Basics EZine strives to provide for you. Please use the form below to subscribe to this helpful monthly newsletter. It also tells you each month about the new information that I have added to this website, including some great tips and advice from myself and other Bookkeeping Basics readers. Fill in the form below to start getting valuable money saving tips for you and your business now! If you're like me, you probably scan and delete most free e-zines. I guarantee that you won't do that with Bookkeeping Basics EZine. With only the most original ideas, it comes to your mailbox every month... but only if and when I have something important to share! No filler and no "regurg"... just original, valuable information. To get your free monthly bookkeeping tips and income tax advice from Bookkeeping-Basics.net, simply enter your information above, click on the subscribe button and enjoy! Bookkeeping Basics E-Zine brings you valuable bookkeeping tips, income tax advice and the latest additions to one small business owner's experiences with "bookkeeping and income tax preparation" in the format outlined below. The in this issue section will start the newsletter off with an outline of what you will find in each individual ezine issue, including links that will take you directly to that part of the bookkeeping basics ezine. The articles section will highlight one to two new bookkeeping articles each month that offer accounting, bookkeeping and income tax tips on performing bookkeeping duties and running a business. It is getting a lot harder to keep on top of the latest news as the number of bookkeeping companies begins to rise, and more and more organizations are starting to provide service to this community. The news area will highlight one to two of the most important current news headlines. The resources section will offer product reviews & discounts as well as other valuable tools such as new ebooks, bookkeeping tutorials and links to updated pages. Questions and Answers - One or two of the most current Questions and Answers from the Q&A forum. Quote of the Month - Some motivation and words of wisdon for the month ahead. SiteSearch - Perform a bookkeeping, accounting or income tax search of my website to get more information on any topic of your choosing. Contact Me - A link for you to contact me at any time with any questions, comments or concerns you may have.